Burnham, Anthony (1999) Maturity for Beginners: the church and an ageing population (Help the Aged). Butler, Michael and Orbach, Ann (1993) Being your Age: pastoral care for older people (SPCK). Carey, George (1997) Care and Dignity in the Next Millennium: will older people have a prayer? (The Abbeyfield Society). Church of England Board for Social Responsibility (1990) Ageing (Church House Publishing). Cunnington, Andrew (2000) How can this be: a study of the spiritual lives of older people (Midhurst Booklets). Duke, Michael Hare (2001) One Foot in Heaven: growing older and living life to the full (Triangle). Howse, Ken (1999) Spirituality, Religion and Older People (CPA). Jewell, Albert (2000) Grow Old along with me (NCEC). Jewell, Albert (2001) Older People and the Church (Methodist Publishing House). Knox, Ian S (2002) Older People and the Church (T & T Clark). Methodist Church (2002) What Shall we do Now? 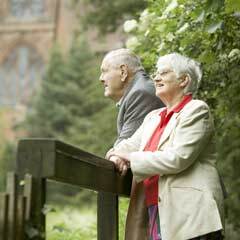 Christian resources for older people (Methodist Church). Jewell, Albert (ed) (1999) Spirituality and Ageing (Jessica Kingsley). MacKinlay, Elizabeth (2001) The Spiritual Dimension of Ageing (Jessica Kingsley). Green, Fred Pratt (1991) The Last Lap (Stainer and Bell). Kellaher, Leonie (2000) A Choice Well Made (CPA and Methodist Homes). Valins, Oliver (2002) Facing the Future: the provision of long-term care facilities for older Jewish people in the United Kingdom (JPR). Froggatt, Alison and Moffitt, Laraine (1997) 'Spiritual Needs and Religious Practice in Dementia Care' in Mary Marshall (ed) State of the Art in Dementia Care (CPA). More than Body, Brain and Breath (Jessica Kingsley). Treetops, J (1996) Holy, Holy, Holy: the church's ministry for people with dementia: suggestions for action (Faith in Elderly People). Is Anyone There - training video pack A 20-minute video with accompanying booklets exploring what we understand by the terms spirituality and dementia, includes real care situations and sequences of worship (CCOA Dementia Project). A Mind to Care - a video about dementia (MHA). Nourishing the Inner Being - produced for MHA Care Group by TVA Care Limited as part of their 'Learning to Care' series. The video is inspired by the Model of Spiritual Care devised by former Senior Chaplain of MHA Care Group, Rev Albert Jewell (MHA). The Person not the Problem - originally performed as a play, this specially commissioned work has now been produced as a video. Complete with notes to provoke and guide questions, it helps both individuals and groups confront some of the issues that dementia raises (MHA). The CCOA Dementia Group has established two projects based in the North East. The first three year pilot project based in Newcastle upon Tyne was a teaching and enabling ministry to health care professionals, clergy and others in the north east. The project worker, Laraine Moffitt also researched and produced resources for anyone involved in the care of people with dementia. The second follow-up project, also based in Newcastle and lasting until November 2000 examined the possibility of diversifying and extending the work in a wider context geographically, and of working with other organisations and other faith communities. For details of publications contact Chaplaincy Centre, St Nicholas' Hospital, Gosforth, Newcastle upon Tyne NE3 3XT (Tel 0191 273 6666 ex 28820). This is a network of people who came together initially because they shared a common concern that people with dementia often were not being regarded as persons with the same rights and spiritual needs as any other person. We have sought to promote a person-centred approach to the care of people with dementia. We are always pleased to welcome new members who share our concern. For details contact Alison Johnson, 33 The Plain, Brailsford, Ashbourne, Derbyshire DE6 3BZ (Tel 01335 361440). This is a local ecumenical group concerned with the needs, including the spiritual needs, of older people. Gaynor Hammond leads a project especially about those with dementia and their carers. FIEP has also developed the Memory Box to help stimulate the memories of people as they grow older. For details contact Gaynor Hammond 29 Silverdale Avenue, Guisley, Yorks LS20 8BD (Tel 01943 879 320). This project was co-ordinated by Rev Albert Jewell who recently retired as Senior Chaplain of Methodist Homes. Amongst other resources, the project produced a series of booklets written to help individuals, local churches and other interested groups share a deeper understanding of the spiritual needs of older people. The Church's Ministry to ageing People. For further details contact Lynn Fox, MHA Care Group, Epworth House, Stuart Street, Derby DE1 2EQ (Tel 01332 296200). The Centre, which is open to those of all faiths and none, aims to be a local and national resource and to be an interdisciplinary centre for the study of ageing, spirituality and social policy, involving older people themselves alongside professionals, carers and church people in understanding the spiritual dimension of life. For details contact Rev James Woodward, The Leveson Centre for the Study of Ageing, Spirituality and Social Policy, Temple Balsall, Knowle, Solihull, West Midlands B93 0AN (Tel: 01564 778022). MHA has a Senior Chaplain, Rev Dr Keith Albans who works from Derby and is responsible for the spiritual needs of residents and staff. Pam Kent, their Spirituality of Ageing Adviser is based at the regional office in Leeds. She previously ran the MHA Centre for the Spirituality of Ageing at Hinsley Hall. For details contact Pam Kent, Spirituality of Ageing Adviser, MHA Regional Office, Brooklands Court, Tunstall Road, Leeds LS11 5HL (Tel 0113 271 5805). In February 2000, the Henry Smith's charity provided funding for a three year project entitled Looking after the Whole Person: meeting the emotional, social and spiritual needs of older people living in residential care. A mid-way report has been published. For details contact SCCCC, 8 Backfields, Sheffield S1 4HJ (Tel 0114 2754021).